This fascinating account of Los Angeles’ buried past tells the story of Job Harriman, a former minister turned union organizer and attorney, who in 1911 was narrowly defeated as mayor of Los Angeles running on the Socialist ticket. Behind his defeat lay an unthinkably brutal, stop-at-nothing campaign headed by Los Angeles’ de facto political boss, General Harrison Gray Otis, publisher of the Los Angeles Times. 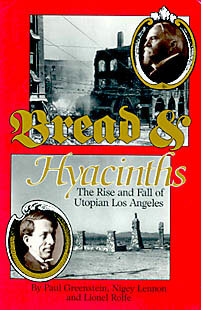 Harriman’s progressive mayoral campaign represented an epic battle for the future of Los Angeles against the bitterly reactionary forces of Otis and his backers. The authors amply demonstrate that Otis was the victor in this contest, and how that victory explains much about why Los Angeles is the way it is today. Bread and Hyacinths follows Harriman through his childhood as an Indiana farm boy, through his formative years as a union organizer and key figure in the formative years of American socialism. It eloquently describes his lifelong optimism and determination in the face of poor health, financial woes, and personal and political troubles. Viewed in perspective against the backdrop of a city — and a nation — torn by labor strife and political corruption, Harriman emerges as a crucial, if ultimately marginalized, figure in American political history. Exciting and well reviewed biography of Job Harriman (1861-1925), socialist attorney who challenged the power of General Harrison Gray Otis, publisher of the Los Angeles Times, was almost elected mayor of Los Angeles, and founded a socialist utopian community called Llano del Rio. This brief, useful book illuminates an obscure chapter in the history of Los Angeles and America’s socialist movement…The book also serves as a corrective to the Times’s distorted history of the Llano del Rio Cooperative Colony, a socialist community founded by Harriman in Southern Calfornia’s Antelope Valley. This slender but potent book draws us into an early and unfamiliar era of Southern California, when Los Angeles seemed more like Charcoal Alley than Lotusland…[A] fine example of what regional publishing can and ought to be: vigorous, knowing, committed and unafraid, even if a bit eccentric.